People usually just wonder "where is my tax refund" after they file their taxes and while they impatiently wait for their tax refund money to arrive. A tax refund delay can be due to many reasons including unsuccessful submission of tax return, IRS overload, system breakdown, lost refund check, and tax refund fraud. It is a tax filer’s responsibility to properly follow up and check the tax refund status before more time is wasted for tax refund recovery. The question of "where is my tax refund" is rightfully justified if we know that 1) we overpaid taxes throughout the year consistent with our prior tax withholdings and tax returns and 2) our life situation has not changed drastically to reduce our expectation for a tax refund. Assuming that our assessment is accurate regarding our expectation for a big fat tax refund from Uncle Sam, what if the tax refund check is not received or deposited into our bank account by the average expected time following the submission of tax return? There comes a point when instead of wondering where is my tax refund money, we need to follow up with the IRS or State Franchise Tax Board to check income tax refund status and make sure we are not facing a tax refund fraud which would be a much more serious case than a check lost in the mail for example. The good news is that IRS has set up a federal tax refund status tracking tool to help tax filers check the status of federal income tax refund. By just providing your social security number or the IRS Taxpayer Identification Number (TIN), filing status whether single, married, etc., and the exact amount of your expected tax refund amount, you can check federal income tax refund status. Sometimes, identity thieves get ahead of the game and file your taxes for you so that they can get your tax refund. Since filing taxes no longer requires submission of hard copy documents which only you possess, it is easier for fraudsters to obtain and submit your soft information and receive your tax refund. In case you face a tax refund fraud, your submitted tax return will be rejected by the IRS as duplicate submission and no tax refund will be on its way to you, at least not until the IRS investigates and resolves the matter. 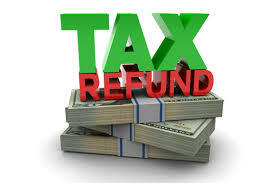 Therefore, it is a good idea to check tax refund status two to four weeks after you file your tax return, depending on whether you mailed your tax return or filed online as well as how you instructed the IRS to send you the refund check either by mail or direct deposit. This way, you can find out quickly if any thing is wrong in your tax return filing and processing cycle and take timely actions to receive income tax refund sooner rather than later. It is also a good idea to not delay tax filing and submit your tax information as soon as possible. Visit the IRS refund website to access "where is my tax refund" tool and learn about your federal income tax refund status.